The area covered by our Training Programme includes much of North, East and West Cumbria, extending from Carlisle in the North, along the Solway and West Cumbrian coast as far as Seascale in the South West and to Kirkby Stephen in the South East. The Programme includes one practice just over the border in South West Scotland at Langholm, and another just over the county boundary in Northumberland at Haltwhistle. The area is largely rural, but there are several sizeable towns, as well as the City of Carlisle. Find out more about our Practice locations and Living in North Cumbria. 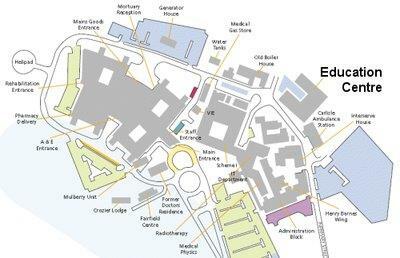 The Programme Office is located in the Education Centre in Cumberland Infirmary, Carlisle. The office is on the first floor of the building.